MOVED TO SUNDAY! 8U, 9U, & 10U Travel Baseball Tryouts are rescheduled for this Sunday, 11/4/18 from 2:00 to 4:00 pm at Ridgway Park. These tryouts originally scheduled for Saturday 11/3/18 have been moved to Sunday due to the impending weather and field conditions. Please arrive 15 minutes prior to start time as tryouts will begin and end promptly. Second Tryout 10/28/18 4:00 pm NEW LOCATION: Click here for 10/28 tryout details. For 8u-12u, HVAA supports a team within the Suburban Travel Baseball League ("STBL"). This league runs concurrently with the in-house program and all travel players must play in-house as well. All travel players must wear their in-house uniforms for in-house games - no exceptions. This highly competitive STBL league pulls from organizations throughout the Bucks and Montgomery county area, culminating in a playoff in early June. From there, many members of these teams compete in their respective Cal RIpken or Little League district tournaments, depending on their national affiliation. Here at HVAA, we are affiliated with Cal Ripken, so our teams will enter the Cal Ripken districts in mid-June. The age cut-off for travel, like in-house, is May 1. 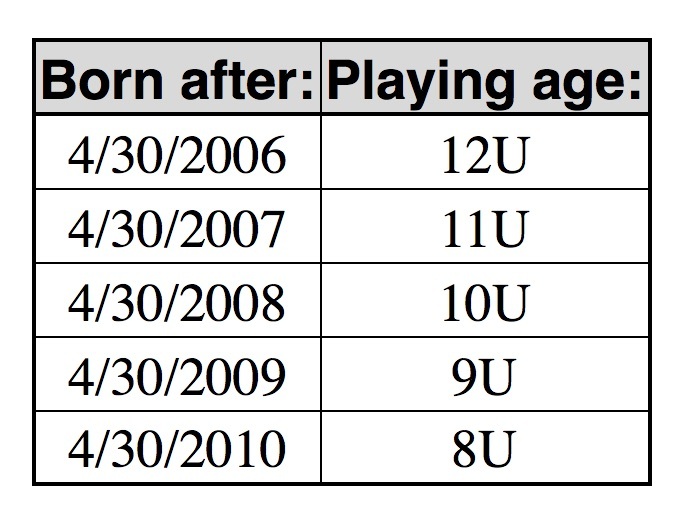 For example, to play on the 8u team, you cannot be 9 BEFORE May 1 of that year. You can, however, turn 9 AFTER May 1, and still play 8u. This example holds true for each age group. Travel baseball is not for all players. Only those players serious enough to make the commitment should consider trying out for a team. The league is committed to improving the skills of all players to their maximum capability. The league also makes the commitment to the players that they will play as long as the player/parent lives up to the expectations stated by the coaches at the beginning of the season (attending practices, proper attitude, on time for games and practices…) Playing time, and how it is distributed, is decided by the head coach. Playing time is not guaranteed to be fair and equal to all players. In addition, circumstances occur that cannot always be anticipated from game to game. For example, games are sometimes shortened due to inclement weather, the mercy rule, or teams being short players. In these circumstances, the parents and players must understand that these situations may occur on occasion and could impact the amount of play received by each player. Although it is the intention of the teams to play an emphasis on “winning games”, “winning at all costs” is not an organization mandate. The philosophy is to build championship-caliber players, not necessarily championship teams. The goal for each coach is player development and advancing their skills, to build confidence in order to take the field and be able to play against any team. Because of the attempts and efforts to win games, all players are not guaranteed equal playing time or playing certain positions. The coaches will assign the players’ positions and roles that are best-suited for player success and place the team in the best position to win games. Player positions and playing time will be allocated by the coach. All players that make a team are required to play the “Season”. This Season is mandatory if the player decides to play travel baseball. The season runs from approximately mid-March through mid-June, with the Winter program starting for some teams in early January at an additional fee. They play approximately 2 games per weekend, held on Friday evening and Sunday afternoon. The organization makes every effort to designate one practice day per week for each travel team. Players in the 8U – 12U teams will also be expected to participate in the in-house Cal Ripken league, as mandated by HVAA to allow for participation in the Cal Ripken District Tournament. Players may have 2 games per week, or 1 practice and 1 game per week for their in-house commitment and running concurrently to the travel baseball season. Once a player makes the travel team, he or she cannot be removed from that team until the following year’s tryouts; however, extenuating circumstances may arise - reasons such as poor behavior on the part of the player or parent could facilitate the removal of the player, as an example. In contrast, should a shortage of players occur, the coach, with approval by the Baseball Director, is permitted to add additional players to the roster without holding a formal tryout. HVAA participates in the Suburban Travel Baseball League (“STBL”). STBL teams must have specific boundaries that conform to the boundaries as approved by their national affiliation. No team shall be permitted to enter the STBL without specified boundaries and every organization playing in the STBL must have a National Affiliation that designates reasonable geographical boundaries for the age groups that are competing. Rostered players must reside, i.e., their permanent residence must be in, the defined territory of the organization. NOTES: Head coaches will assemble their assistant coaches when the final team is selected. The Baseball Advisory Committee members may also be assigned to teams to provide mentorship to the coach, track the progress of the team and gauge parental interaction. Tryouts are held in late fall or early January, depending on team. Tryouts are advertised on our website and email blasts (efforts will be made to utilize folders at schoolas well). The coaches chosen for those travel teams and 2-3 members of our Baseball Advisory Committee will conduct the tryouts. Evaluation forms will be used to assist with gauging the skills of all players, focused on the core areas of hitting, fielding, throwing, and base running, as well as specialty areas such as pitching and catching. The coach and Baseball Advisory Committee members will convene following the tryouts to either select or short-list prospective team members. These players will be invited to participate in the Winter workout programs outlined by each coach/team. One final tryout may be held in February to make final selections to allow for any new residents an opportunity to participate. HVAA will field a team in the following age groups: 8U, 9U, 10U, 11U, 12U. May 1 is the age cutoff. Following the spring travel and in-house seasons, open tryouts will be held by the coaches at each age group level for participation in the Cal Ripken Tournament. Any travel or in-house player is invited to the open tryout to select the tournament team. Additional costs may be realized for hats, pants, socks and other items required as part of the HVAA District uniform. In addition, coaches may also enter teams into local summer tournaments (examples include tournaments run by Horsham, Southampton and Valley AA). These tournaments generally run on a Thursday or Friday night and finish on Sundays. The coaches will identify the tournaments and interest – these tournaments will require additional costs to participate. Approximately one-half of the games are played at our home fields. Games are generally played on Friday night (6 pm) and Sunday afternoons (between 1-6 pm), from early April through mid-June. 8 year-old teams play 10 games on 60 foot bases with a 46 foot pitchers mound. 9 year-old teams play 12 games on 60 foot bases with a 46 foot pitchers mound. 10 year-old teams play 14 games on 60 foot bases with a 46 foot pitchers mound. 11 & 12 year-old teams play 14 games on 70 foot bases with a 50 foot pitchers mound. Additional games may be included as part of pre-season scrimmages and post-season playoffs. Coaches may require players to arrive at least 1 hour prior to the game for proper warm-ups and game preparation. Travel starts with the 8-year-old team (primarily 2nd/3rd graders). When playing in-house baseball, we encourage players to play with their grade (with their classmates), however, given the May 1 age rule; when playing travel baseball they must play with the team at their AGE unless granted an exception by the Baseball Director.